The Moon is on the wane changing the focus from rising energy to downward energy. Shift your gardening focus to the root systems of plants and to pruning. 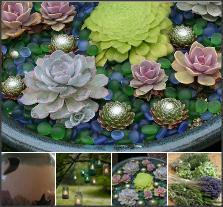 We are officially in the 3rd quarter now with a focus on perennials and biennials. If you’ve been wanting to divide that mass of day lilies, society garlic, or monkey grass, now’s the time! 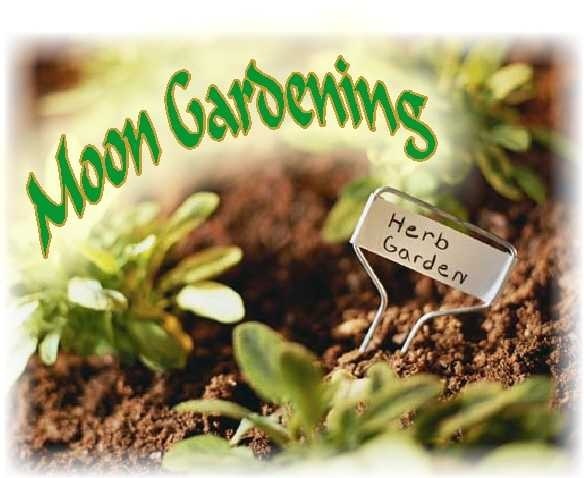 You can plant or repot new perennials in your garden during this Moon quarter because they are essentially root plants. When buying perennials, take a look at the roots. That’s where your investment is. 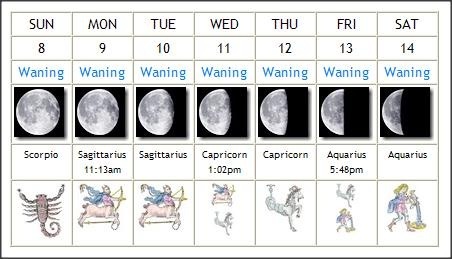 Here are this week’s moon sign and phase changes. Times are EDT. Sunday rounds out the weekend in fertile Scorpio. Scorpio’s colors are deep reds, maroon, deep purples, and black. Irises are in the nurseries now. If you’d like to add a touch of this intensely passionate sign to your garden, consider Black Irises (if you can find them) or deep purple elephant ears. A few perennials associated with Scorpio through it’s planetary ruler, Mars, are garlic, ginger, radishes and horseradish, reeds, thistle, and Artemisia (wormwood/mugwort). Wormwood adds a soft silvery green texture to the garden. 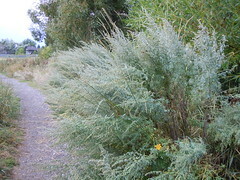 Artemisias available in nurseries are probably Artemisia Vulgaris (mugwort) and dusty miller. Mugwort is a common addition to dream pillows and gives them their distinct herbal scent. If you’re interested in Artemisia absinthium, the type which was used to make absinthe or flying powders, you’ll be more successful contacting a herb farm rather than one of the big store nurseries. Naturally, all the predator plants (Venus Flytrap, for example) are associated with Scorpio. Hold on, Scorpios! It’s because of Mars, not your birth sign. 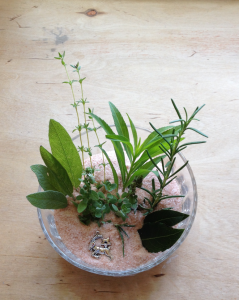 I’d also add any of the resurrection plants to the Scorpio category ~ rose of jericho and the resurrection fern. The Moon moves into Sagittarius midmorning on Monday. Sagittarius is a dry, barren sign better suited to pest removal and general cleanup chores than planting. Onions and leeks are good to plant during this sign, however. If you plan on doing some pruning during the waning cycle, wait until Capricorn if you can because wood is said to heal well during this sign. Beets are a plant of Capricorn, so the waning cycle is perfect for planting these root veggies. Plant other root veggies and flower bulbs, too. Are you wondering what to do with your Easter Lily? Plant it in your garden if it has finished blooming. 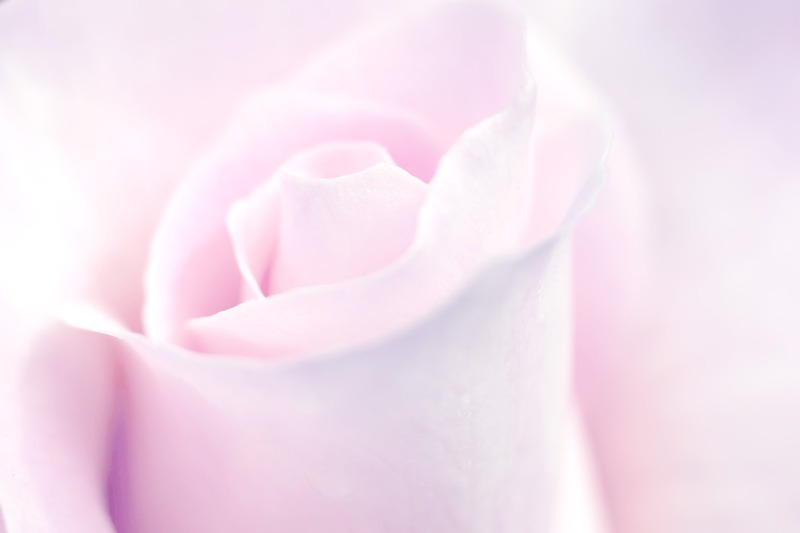 Next best time to plant them during the waning phase is on the 16th or 17th when the Moon is in Pisces. Moon in Aquarius arrives Friday evening and lasts through the weekend. Aquarius is all about community. If you belong to a community garden, the weekend is great for getting the group together to work the soil and harvest anything that may be ready. The last of the cool season greens, for example. If you have too much to use, think about taking what you can to those who may need it. In other words, spread the bounty. I’d love to hear what you’re growing now and how this year’s warmer temps have changed your normal gardening chores.